Alaskan Rose highlights a busy racing schedule for Ballymore Stables over the next few days, the classy three-year-old heading to Sydney to contest Saturday's Gr.3 Adrian Knox Stakes at Randwick. Opening up favourite in the $200,000 2000m contest, Alaskan Rose (pictured) has pleased in her work around the Sydney way of going - in fact it seems she is going even better than she was in Melbourne! "She is absolutely flying," Michael Moroney enthused, "we could not be happier with her." "She does have the visitor's draw (14) which is the only concern but she has been in great form and she looks a top chance for Dwayne Dunn." We also have a very nice horse in Saturday's Victorian feature, the Listed Mornington Guineas - But It's True rising in grade off a stunning six length maiden victory at Warrnambool earlier in the month. "He is a very good horse," Moroney said, "one of our better ones no doubt. He was super impressive at debut and he has progressed extremely well since." Drawn nicely in barrier three, the son of High Chaparral will again be ridden by Jamie Mott. In the days leading up to Saturday we have a number of nice runners kicking off with Power Of Patch who looks nicely placed to break his maiden in the fourth race at Hawkesbury on Thursday. A game runner-up at his last two starts, the High Chaparral gelding is nicely primed for a step up to the mile. 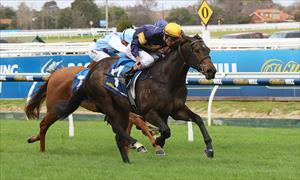 "He is a nice staying horse in the making," said Moroney, "and the further he goes the better he will get. He is starting to get up to his right distance now and he should prove hard to beat." Later in the day we have another promising maiden in the shape of Geodesic, the handsome black three-year-old a leading contender in the 2000m maiden at Pakenham. "He is a very interesting runner having his first start over a trip. He has come on very well since his last run which was good, he is doing everything right." We also have two runners at the Warrnambool meeting on Thursday, the first of which is the exciting Barraaj who makes his debut in the third event over 1100m with Jamie Mott to ride. "He is a pretty smart horse, very fast," Moroney said. "He jumped-out well here and it doesn't look a particularly strong race, he should go close." Cape Londonderry meanwhile is likely to find 1600m too short when he lines up later in the day - "he should run better than he did first up but he is probably still a run short, he is a typical Pentire who will improve as he gets over further." Sapphira is our sole Friday runner, suited up to 1400m at her second run back from a spell. "She ran a much better race last start," Moroney said of the daughter of Flying Spur, "and she did not have a lot of luck. She is on the improve."